Midnight of Halloween is fast approaching in my time zone, which means I have only a few minutes left before I have to run out to the hilltop to begin the incantations to call down Yog-Sothoth, which must be done exactly as the bell strikes twelve or I won't get another chance until the Feast of St. Walpurgis. However, before I go, I want to direct your attention to Brad Noel's article on the Christian-ness of Halloween over at Southern Fried Catholicism. Since Halloween is the official Christian holiday of The Sci Fi Catholic, I just want to say, I'm the Deej and I approve this message. Wah! 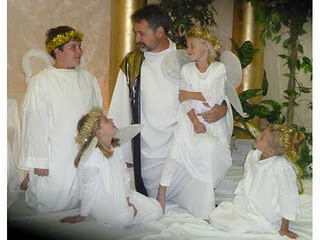 Adorable children dressed as angels! I'm the Deej, and I approve this message, too. Alive and Kicking, Sort Of . . .